I too loved Deborah Needleman’s eclectic use of vintage furniture mixed with contemporary pieces thatare truly practicle in modern living. It actually looks as if someone who lives there reads and burns fire in the fireplace. I was also wondering if you might be interested in a reciprocal link to our website and blogs. http://www.blinkdecor.com/decoratorsdish/ or http://www.blinkdecor.com/renovatorsroundtable.com/. Thanks for your consideration. 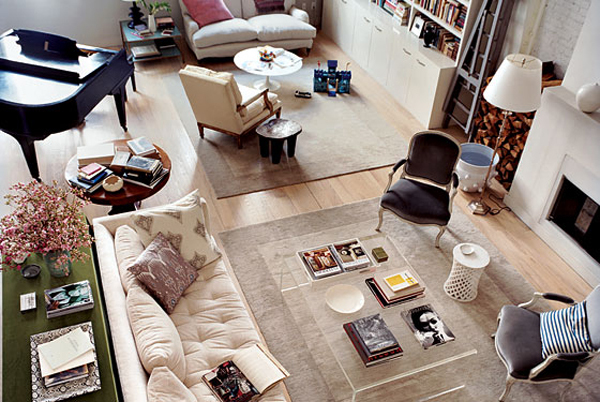 oh i loved this shot too… and the little loveseat in the corner is my dream one. i wonder where it is from?? Love the airy, natural light, spacious feel of this place. The ceiling must be high, it’s a wonderful photo too. Picture is completely incredible,its perfection ,The room is so incredibly fabulous! Love it! great job on every detail.looks so elegant and airy feeling.thanks its nice post!